The alarm went off at 5am. It was one of those see-the-sunrise-at-(insert icon here) days. 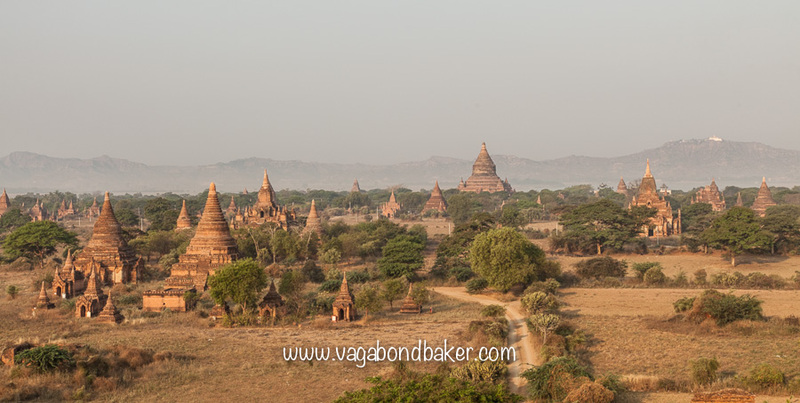 An early wake up call to see dawn over a travel icon: today we would greet the new day overlooking the many temples of Bagan. 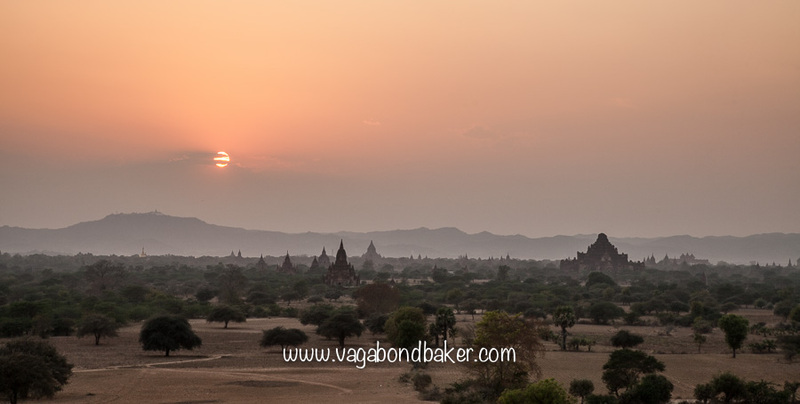 The famous Bagan Sunrise. 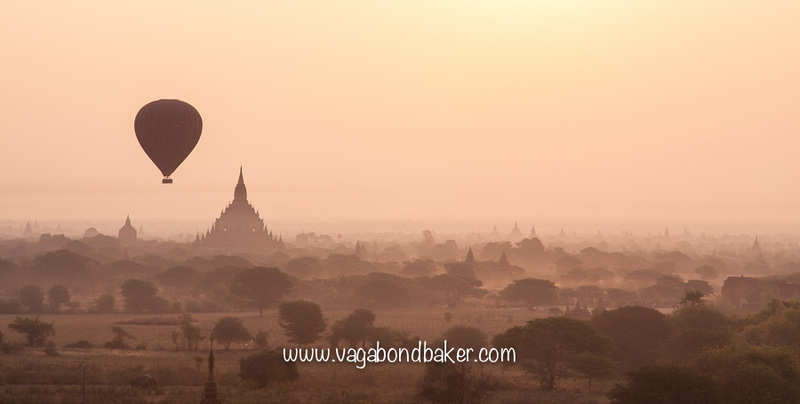 We’d arranged with the bike shop opposite our guest house that we would collect our e-bikes at 6.15am, not quite early enough to catch the sunrise but hopefully plenty of time to reach Shwesandaw Paya to see the hot air balloons float over the plain. The balloons hadn’t flown the previous day due to the weather but the day began clear and cloudless. As we rode along the top road we could see the balloons full of air and ready to fly, they were lashed together behind a row of low trees. 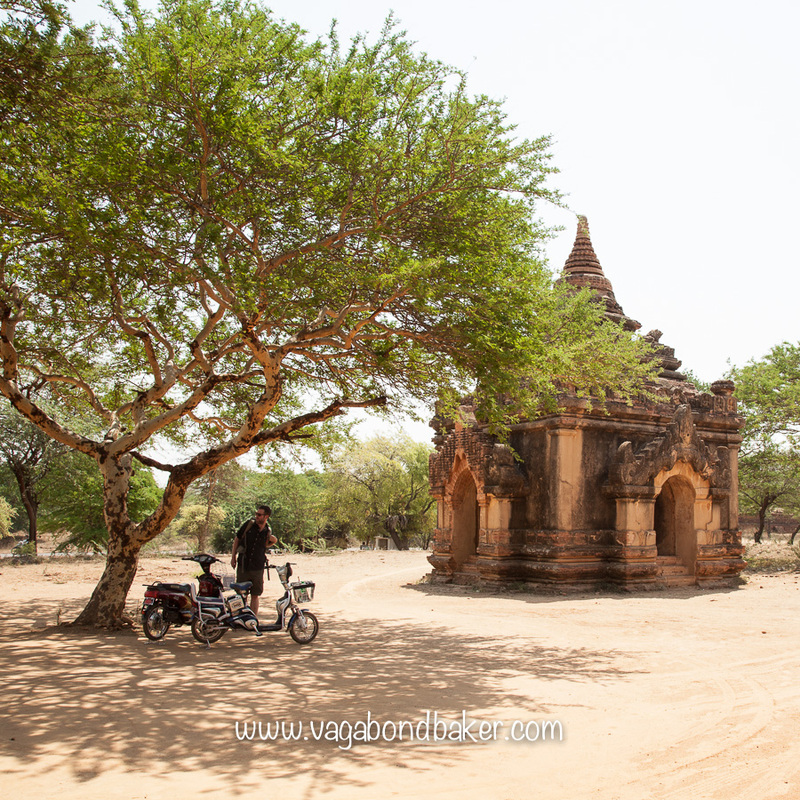 We sped up our little bikes and were soon joining the small throng at the top of the pagoda. Karen and Robert (our cabin mates from the overnight train) were already there, snapping away at the golden view. A fine low line of mist clung to the far temples, backlit attractively by the rising sun. 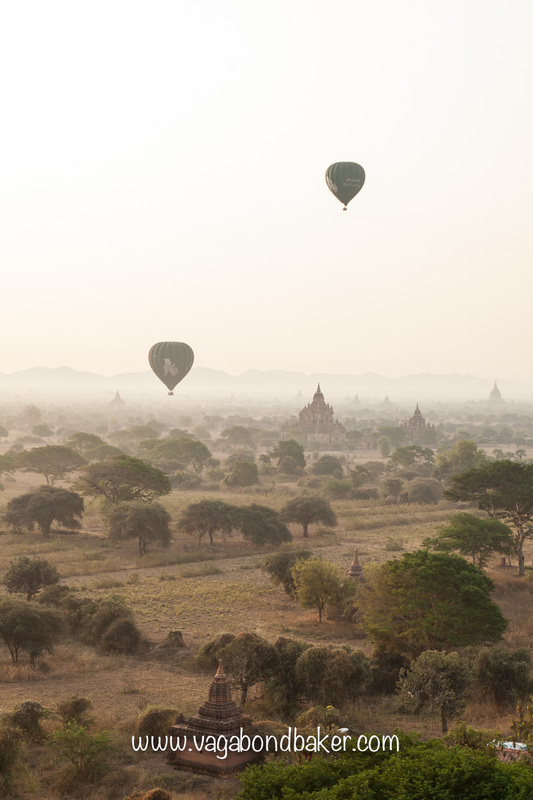 The hot air balloons began to drift across in an even-timed stream from the north-east to the south-west. What was already a beautiful view was now transformed into something utterly sublime, the peacefulness of the scene was magical. The balloons, one by one, floated across then drifted out of sight. I mentally thanked the tourists– with a much higher budget than mine– for taking the balloon trip and making my morning unforgettable. 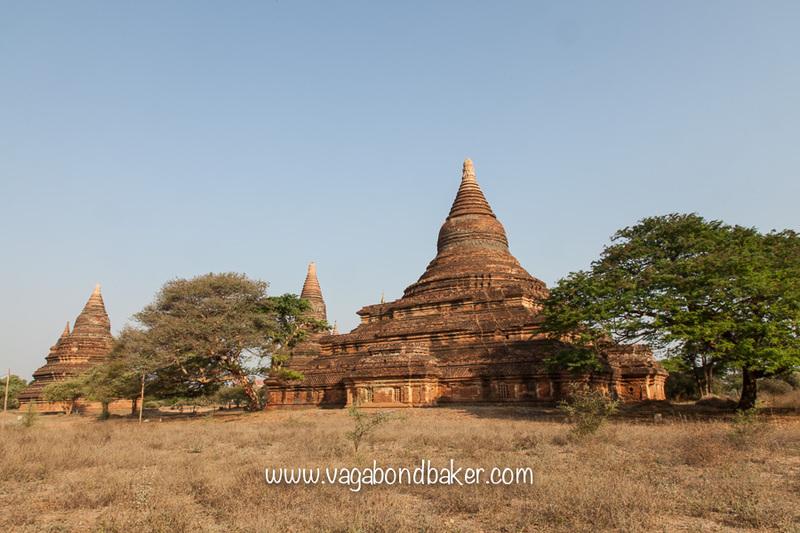 Whilst the air was cool and the light was beautiful we left Shwesandaw Paya and headed to the temples within the walls of Old Bagan. The map we had didn’t seem to match the layout of the temples so we just rode around stopping at the ones we liked the look of until Chris’s need for coffee became too much and we stopped for a break. 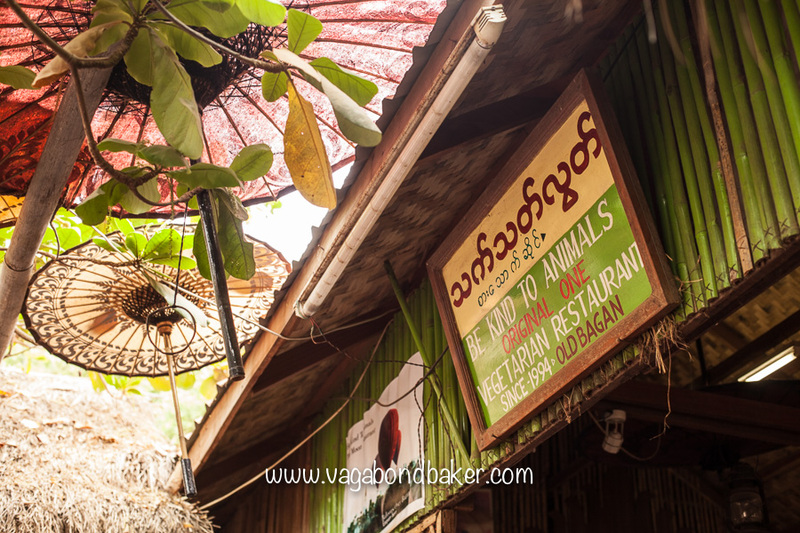 We had breakfast at The Moon Be Kind To Animals, a wonderful vegetarian restaurant near the north entrance to Ananda Pahto and the Tharabar Gate. A kooky place with sparrows busily nesting in gourds hung from the decorative trees and small fish swimming in large raised water dishes dotted between the tables. It had only just gone 9am, we’d already packed in three hours of temple exploration! While devouring our noodles we’d watched a line of saffron-robed monks walk past the restaurant, returning with their alms bowls. After we’d eaten we rode in the same direction where we found a modern monastery and a working temple. 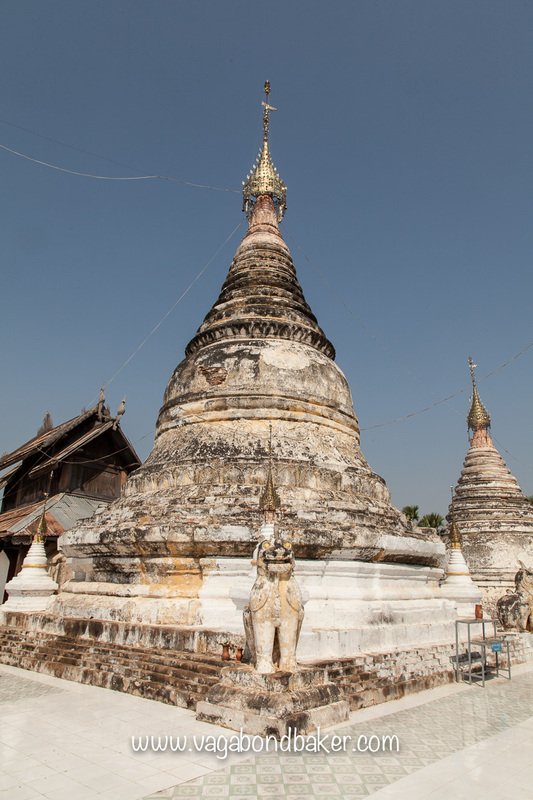 Behind it was a raised platform dotted with white stupas that looked striking against the blue sky. 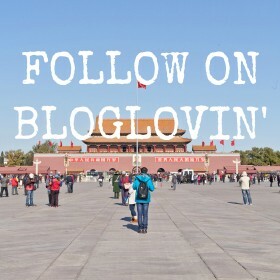 The floor of the platform had been renovated and covered with bright white glazed tiles: blinding in the morning sun. 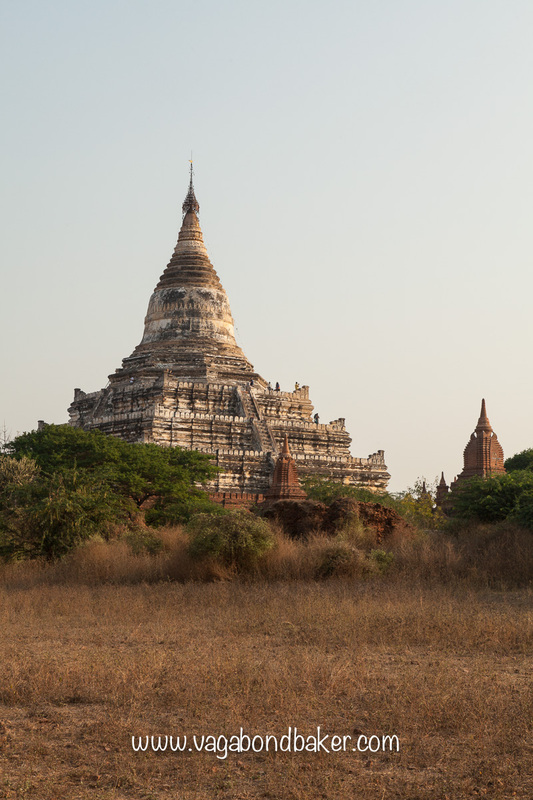 We hit the main road, crossed over it and visited Mingalazedi Paya, a huge terraced temple topped with a bell shaped stupa. We had it entirely to ourselves; climbing up to the second level we walked around it admiring the glazed tiles set into the walls. On one side of the terrace we found a sliver of shade and sat for a short while gazing at the view. 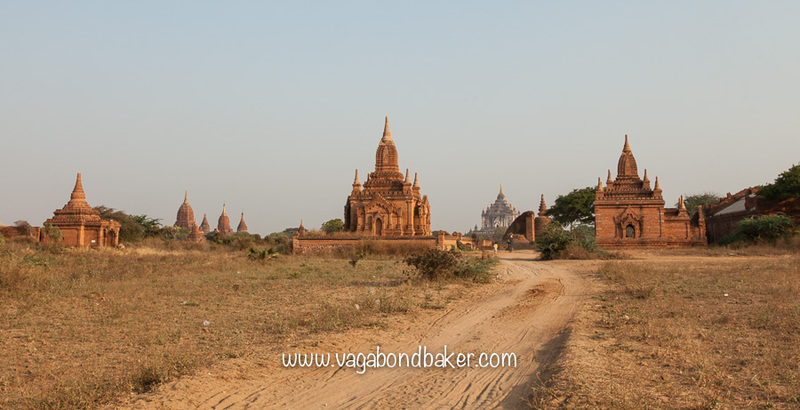 Moving on, we took the road south towards New Bagan, passing through the village of Myinkaba. 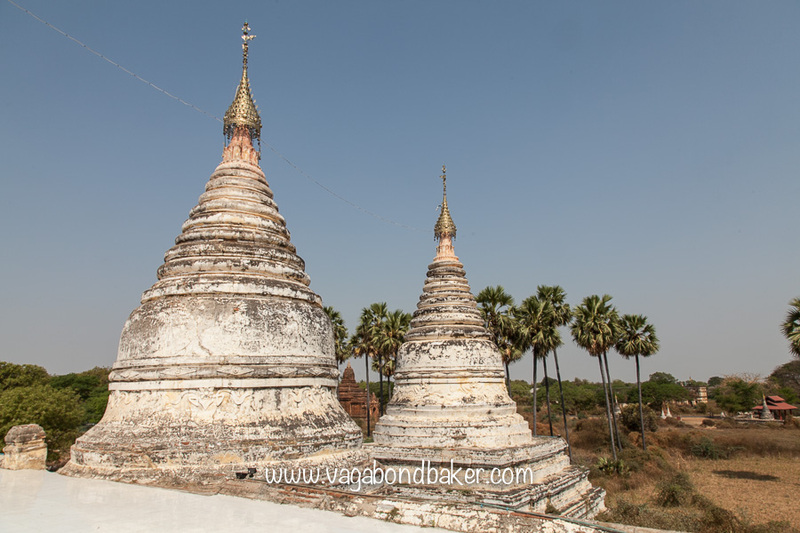 We passed a few ancient temples then pulled off the road at a cluster of stupas and a temple, partly because my seat felt loose (it wasn’t). Deciding to look around a sand painting vendor pointed us to the entrance of the temple. 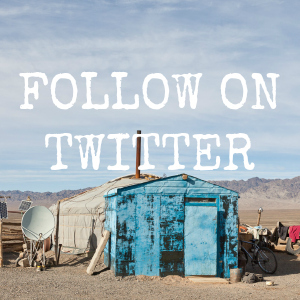 The sand paintings they produce are extraordinary, beautiful things; the best are very colourful and highly detailed. 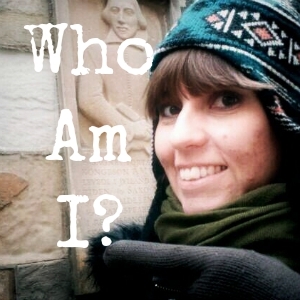 Inside the temple was dark, tiny windows failed to illuminate the walls. I realised that one of the walls was covered in a raised grill, I’d seen this in a couple of the other temples to prevent tourists from brushing against the fragile art work. Chris dug out his head torch and a wonderful fresco was revealed. We swept the walls with the torchlight and they came to life with jewel-coloured scenes showing Hindu deities paying homage to Buddha. A Burmese couple who had been walking around the temple in the dark now joined us, cooing at the beautiful murals now suddenly revealed to them. 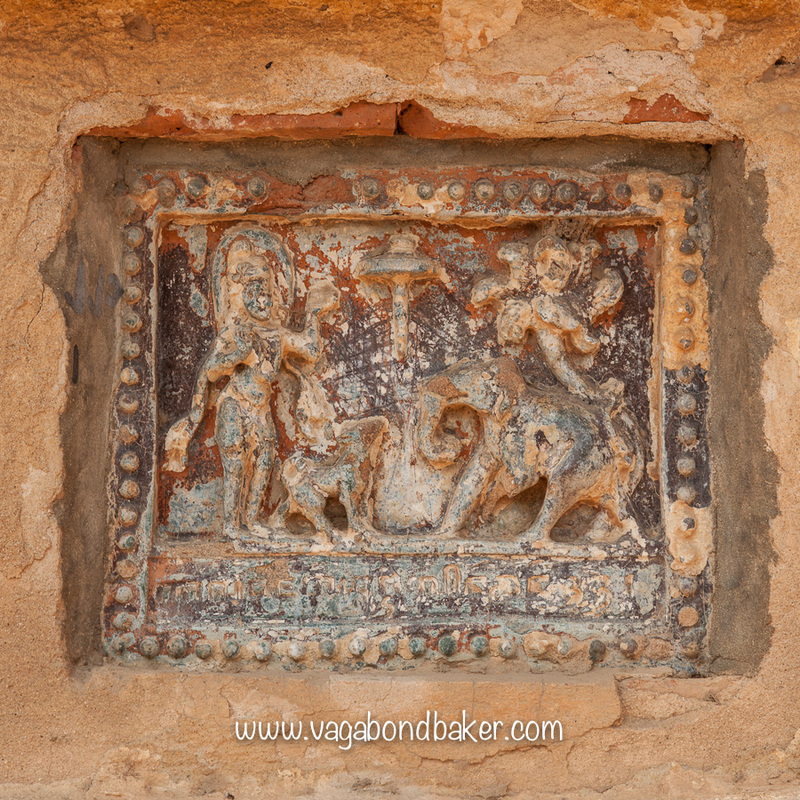 We checked our guidebook, the temple was Abeyadana Pahto, UNESCO had cleaned the ancient frescos. Heading back through Myinkaba we stopped at Gubyaukgyi, another richly painted temple. 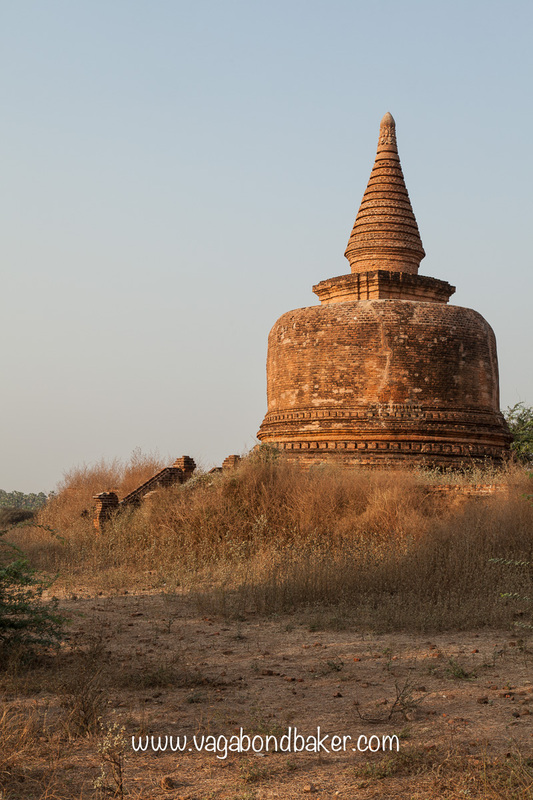 I’d spotted the magnificent gilded Myazedi, (Emerald Stupa) that stands next to it on the ride through the village earlier and couldn’t resist a closer look. 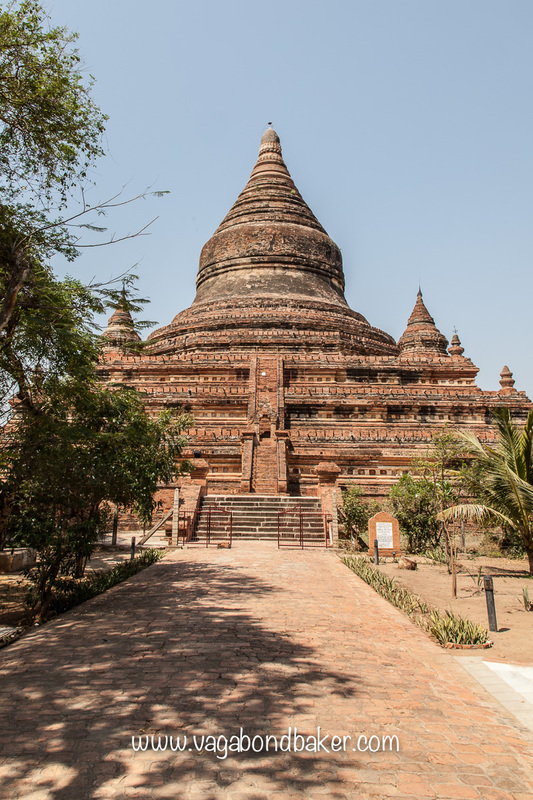 Gubyaukgyi is like a larger version of Abeyadana Pahto, similar in structure and decorated with equally beautiful paintings. The torch came out again, although there were more tourists here and guides were flashing torches all over the place. We pottered over to the golden zedi, the tiles leading over there were blisteringly hot, all these hot tiles, dusty paths and brick temples were playing havoc with my feet; yet, I also found it rather wonderful to be barefoot, I was getting used to flicking off my sandles at the first opportunity. We met Mike for a long, lazy lunch then headed back to the guest house to pack, nap, and get out of the blazing sun for a while. Refreshed, we set off to see sunset, arranging to meet Mike at Pyathada Paya, seemingly another popular sunset spot. Mike had described the temple, we spotted it on the horizon near Sulamani Pahto only for it to disappear out of view. We rode in the general direction along a narrow, bumpy, rocky path between spiky hedges– surely this isn’t the way?– bursting out the other end into a ploughed field. I climbed up a small mound to see if I could see the temple, then out of nowhere Mike appeared. The three of us set off, following a young local couple on a motorbike assuming they were heading there too. 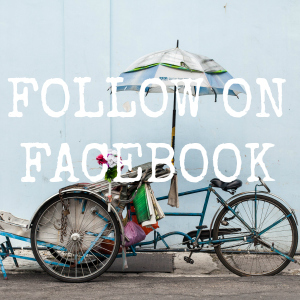 It turned out they were young lovers looking for some solitude, with three grubby Brits on electric bicycles trailing them. Very kindly, and possibly to be rid of us, they put us on the right track, leading us back and towards the temple. The right route soon became very apparent, suddenly we were in a rush of traffic: tour buses, motorbikes and cars negotiating the loose sandy track. I had to slow right down, my wheels were sliding all over the place and I had visions of disappearing under a bus. 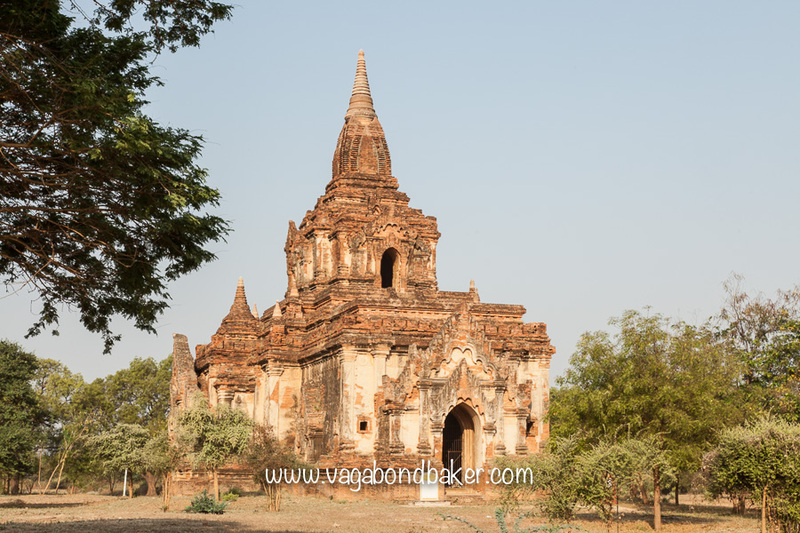 Pyathada Paya is a large brick temple with a vast open terrace on the upper level, perfect for a gathering of sunset worshipers. The platform was accessible by a single narrow staircase within the partially ruined building; dark and steep, our ascent was illuminated by votive candles placed on the steps. 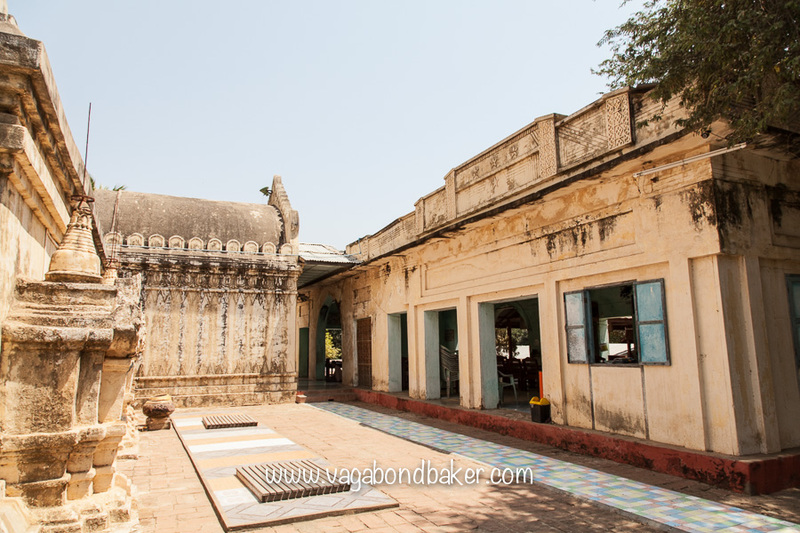 It was so much busier that Shwesandaw Paya the night before, from the terrace we watched domestic tour buses come and go and a steady stream of tourists filtered up the stairs to see the view. Pyathada Paya seemed to be the place to be, we met up with most of the backpackers we’d met in Burma so far, either in the guest houses or out templing. We all got chatting, swapping stories and forward travel plans. The sun began to descend washing hazy golden light over the temple studded plain. 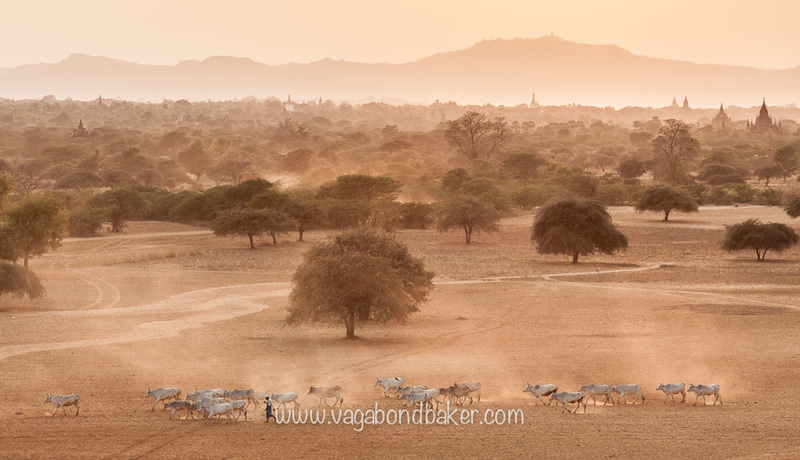 A farmer drove a small herd of cattle across the plain in front of us, beautifully backlit by the setting sun; it completed the scene, a timeless moment to end our time in Bagan. It soon became very apparent that it would take ages for everyone to get down from the terrace, the narrow staircase became clogged and a mass crowded around it. We held back, chatting away, and were some of the last to get down. Monks and domestic tourists had us all posing for photos with them, it was quite amusing. One monk was very selective, only wanting the pretty girls! Night had almost fallen by the time we reclaimed our e-bikes and darkness soon blanketed everything. Our e-bike headlights were utterly ineffective at illuminating the sandy road, buses and cars beeped at us to warn they were passing. We soon came across a couple of young backpackers, one of their e-bikes had completely died, luckily a local lady in a smart hatchback had stopped to help them and as we stopped to check they were ok a policemen arrived too. There was nothing we could do so we wished them well and set off. There was five of us in total riding back to Nyaung U, we had to hang back a little as Chris’s battery was looking quite low so he didn’t want to risk going to fast and eating up what power he had left. The journey seemed a long way in the darkness. We all went to a small Burmese/Chinese restaurant next to the guest house, I’d had noodles for breakfast so I had pancake for dinner. It was a Burmese pancake and really stodgy, I could only manage half of it. 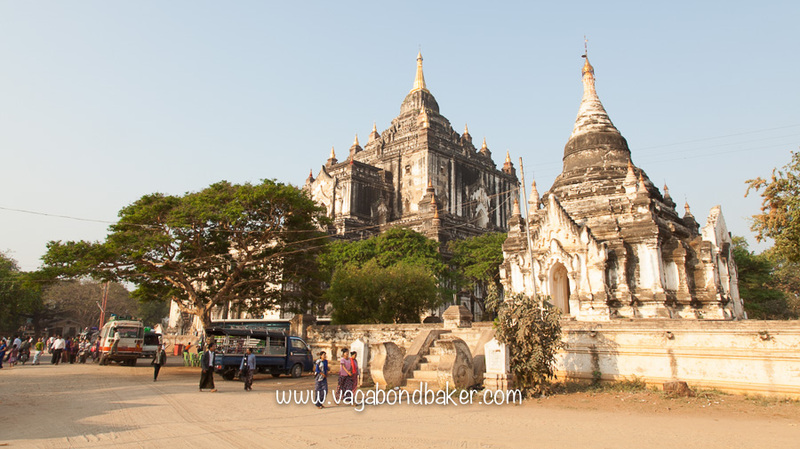 That had been our two and a half days exploring Bagan, it had been enough and we’d seen a lot. 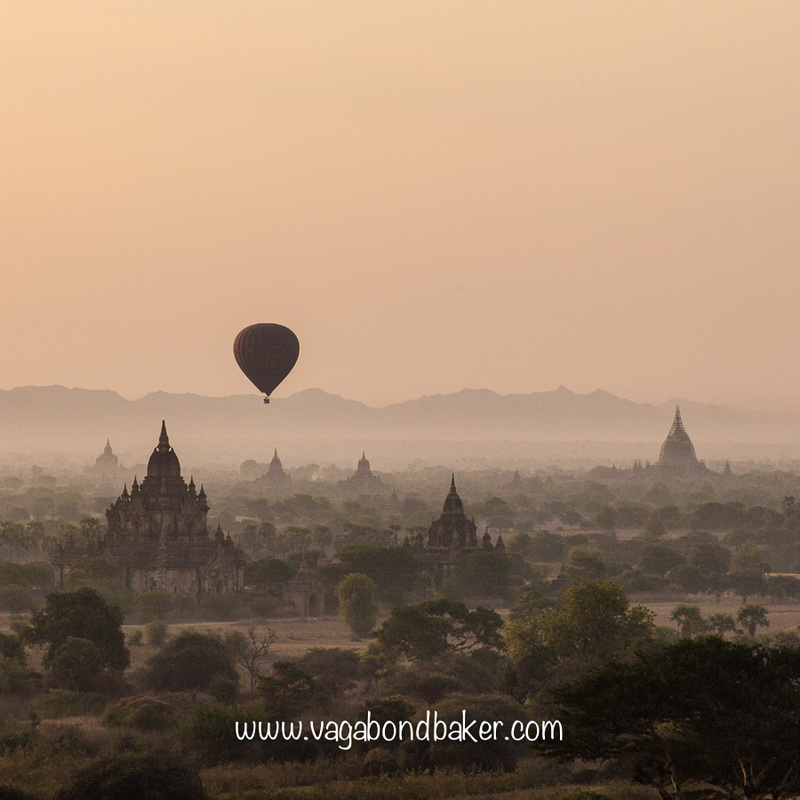 I had been concerned that we were templed-out from the temples of Angkor, in Cambodia, only a couple of weeks previously and that we wouldn’t appreciate Bagan enough; but that wasn’t a problem, the landscape is so extraordinary and the temples are so different. 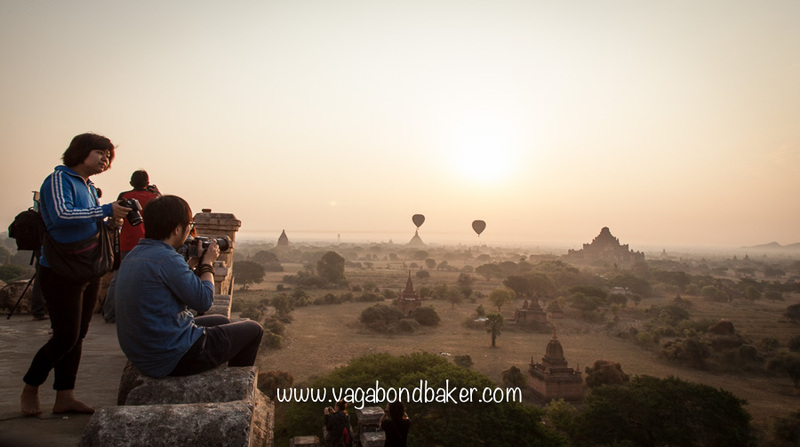 I had found Bagan to be completely bewitching, every sunrise and sunset had been unforgettable, magical experiences that would stay with me forever. 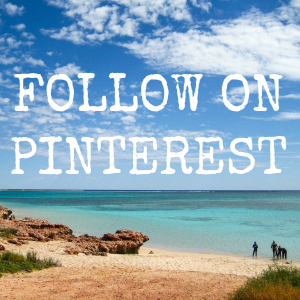 It is a touristy destination, there is no escaping that but don’t let it put you off. 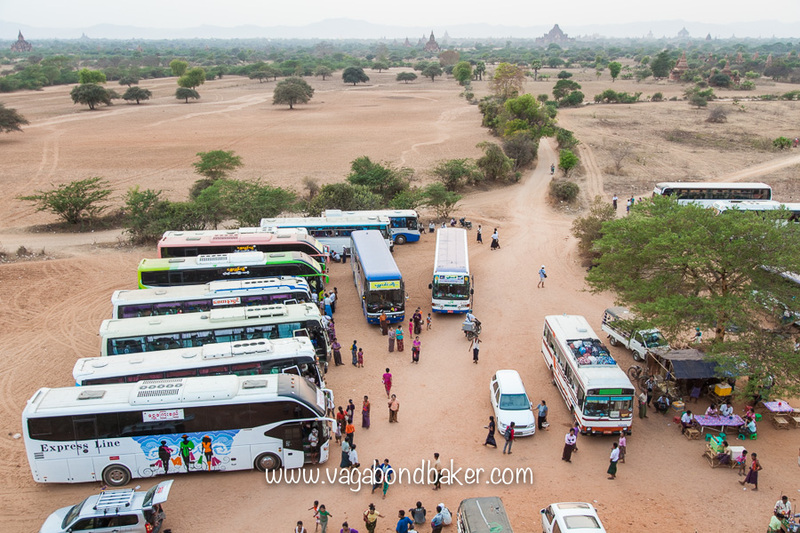 Bagan is a travel icon for a reason, it is truly spectacular, of course people want to see it! 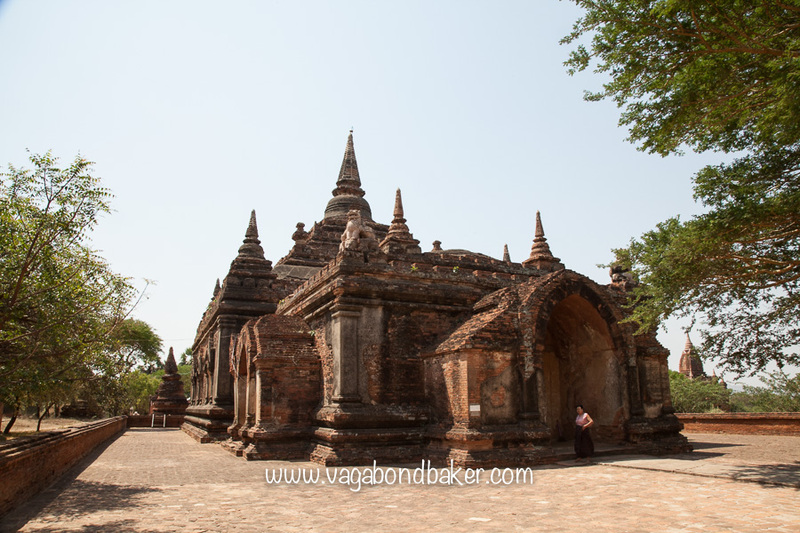 Most of the tour groups we encountered were domestic, Burmese tourists visiting one of their greatest treasures. One of the marvelous things about Myanmar is that the people mainly wear traditional dress over generic western-style clothing: wonderful longyi (skirts) in checks and patterns.